Welcome to the micro Manufacturing Medical Automation and Robotic Systems (MARS) Lab of the Mechanical and Aerospace Engineering Department at The University of Texas at Arlington. The MARS lab is a dual purpose lab; it caters to both academic research as well as industry sponsored research. Academically, it is used as a teaching environment a teaching resource for manufacturing, automation and robotics based classes and/or research where hands on robotic instruction is encouraged at both the graduate and undergraduate level. 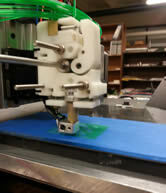 Industry funded research projects involve automated workcell studies using state of the art hardware and software tools. These interactions provide not just additional educational and research opportunities to the student, but also provide valuable research to the sponsoring company. This interaction helps to bring university and corporate resources together is benefical ways for both. The real beneficiaries however are the students who graduate better prepared in the fields of robotics, manufacturing, automation and controls. The laboratory is a dual use laboratory where in addition to the advanced research activities, educational activities utilizing the resources of the lab relating to robotics, manufacturing, automation and controls take place. Please feel free to explore the information on this web page and feel free to contact us should you like to have more information on various research and educatonal activities of the lab and if possible, we would share information with you. As the director of the MARs lab, I would like to personally welcome you, να σας καλωσορίσω προσωπικά, to the MARS lab web site. Ankit successfully defended his MS presentation on the customization of a multi-modality additive manufacturing system on December 12, 2014. Congratulations and wishes for continued success! Salman Khan awarded scholarship, December 2014. Salman was awarded a scholarship in December 2014 from the Dr. Shamin Sughra Malik Scholarship fund in recognition of his current progress and succes in engineering. The scholarship is admninistered by the College of Engineering. Congratulations! Salman Khan at the 2014 IEEE Medical Device Symposium. Salman presented a poster on his doctoral research work titled A Study of Finite Element Structural Analysis of Allograft for Endothelial Keratoplasty at the 2014 IEEE Medical Device Symposium held at The University of Texas at Dallas, TX, Nov 7, 2014 . Congratulations and wishes for continued success! Senior Design team for Fall 2014 and Spring 2015. The lab welcomes a new senior design group who will be researching the design and development of a mechanical hand-end effector for irregular object manipulation for Fall 2014 and Spring 2015 semesters. Welcome and looking forward to your accomplishments! Mohammed Aliakbar completed the I-Engage program. Mohammed, Salman and Dr. Shiakolas participated at the luncheon honoring the I-Engage participants in August 2014. 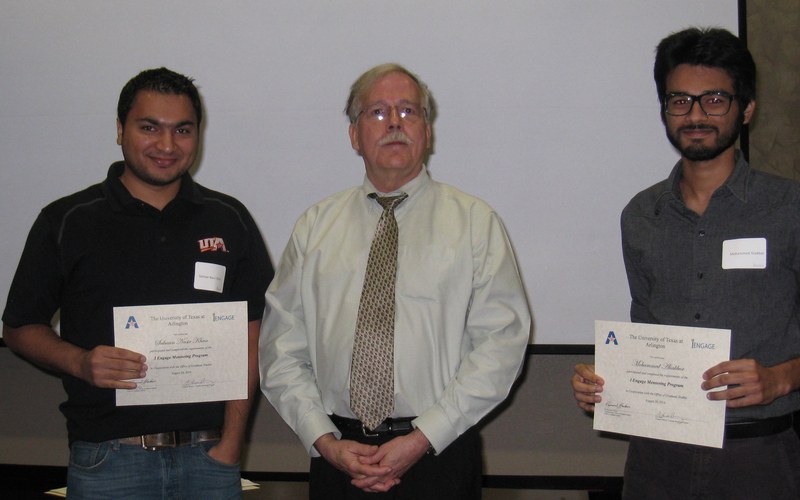 Salman and Mohammed are shown wiht Dr. Jackson and I-Engage completion certificates. Congratulations and wishes for continued success! Shahid Faizee and Vishal Sarode join the MARS lab, summer 2014. The lab welcomes Shahid Faizee and Vishal Sarode, both ME MS students, who will be researching 3D printing technologies. Welcome and looking forward to your accomplishments. Senior 3D printer InkJet head team successfully presented their project, August 7, 2014. The senior project students working on inkjet head development and integration successfully presented and defended their project on August 7, 2014. Congratulations and wishes for continued success! The lab welcomes Mohammed Aliakbar who will be mentored by Salman Khan during the summer of 2014 under the I-Engage Mentoring program of the UTA Graduate School. Mohammed will be learning how to use CAE tools (ANSYS) to research opthalmic grafted devices. Mohammed welcome and looking forward to your accomplishments. 60th ASAIO Conference, Washington DC, June 2014. The ME second semester senior group sponsored by the MARS lab was invited to participate and present their design project research in the ASAIO Second Annual Student Design Competition to be held on June 19th during the ASAIO 60th Annual Conference, June 18 – 21, 2014 in Washington, DC (https://www.asaio.com/annual-conference/student-design-competition-2/). 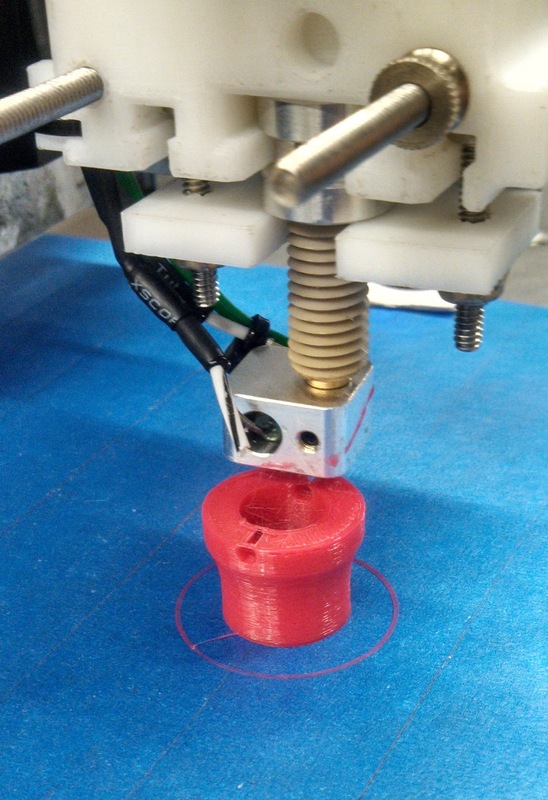 The title of the submitted project is Multi-Polymeric 3D Print Head for Use in Bioprosthetic Research. Here is the link to the conference program - scroll down to page 9 second column (https://www.asaio.com/wp-content/uploads/2013/06/Final-Program-MMD-2014.prog_.pdf). The team members are Toby Anderson, Russell Collins, Andrew Dierdorf, Ryan Moody, Jacob Oberg (team leader) under the direction of Dr. Shiakolas. Note that 48 national-international teams were invited to submit their proposals for the competition back in early spring and 8 submissions were selected as winners. Congratulations on being one of the winners and the invitation (along with partial financial support) to participate and present your project in this national - international competition! Senior Projects sponsored by MARS Lab (May 2014). The three senior groups in ME and CSE Departments sponsored by the MARS Lab for their senior design projects have successfully presented and defended their research work on Friday, May 2, 2014. The second semester ME group presented on the multi-material BioPrinter and the CSE group presented on custom software for multi-material additive manufacturing. The students in these groups have so much fun learnining and working on the BioPrinter and some of them are already volunteering to assist on the BioPrinter project during the summer and beyond - we are excited and we look forward to seeing some of you this summer and continue research on this exciting new field that is revolutionarizing manufacturing! The first semester ME group presented their research for understanding and selecting ink-jet type technology for augmenting the BioPrinter features. We are looking forward to their successful integration of their solution this summer (summer 2014). Congratulations for a job well done! 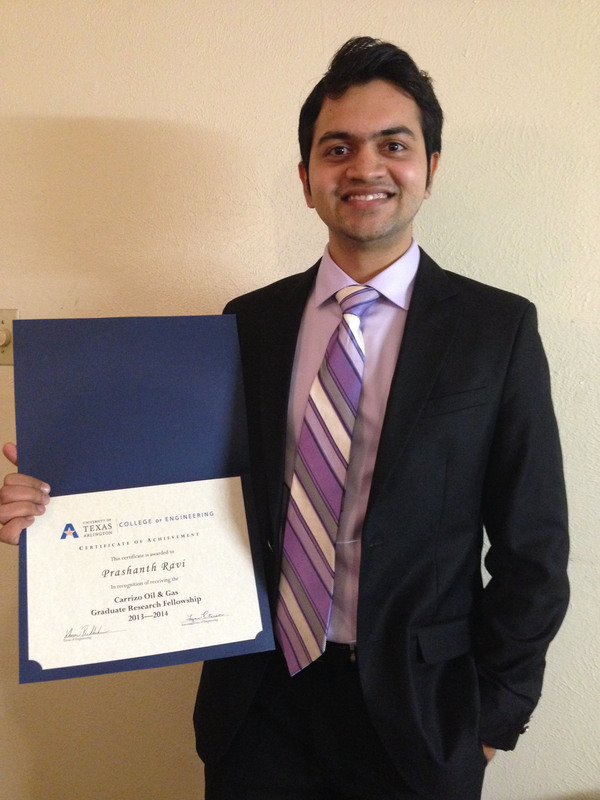 Prashanth was awarded the prestigious University Scholars Fellowship for the 2014-2015 academic year by the Honors College of UTA (May 2014). Congratulations! Salman was awarded the prestigious Dissertation Fellowship for summer 2014 by the Office of Graduate studies of UTA (May 2014). Congratulations! Congratulations are in order for Ryan - keep up the great work! Ryan sucessfully defended his MS thesis Improving Scoliosis Rehabilitation on April 14, 2014 (wow 4-14-14)!. Keep up the great work and the group is looking forward to your endevours. Congratulations are in order for Salman - keep up the great work! 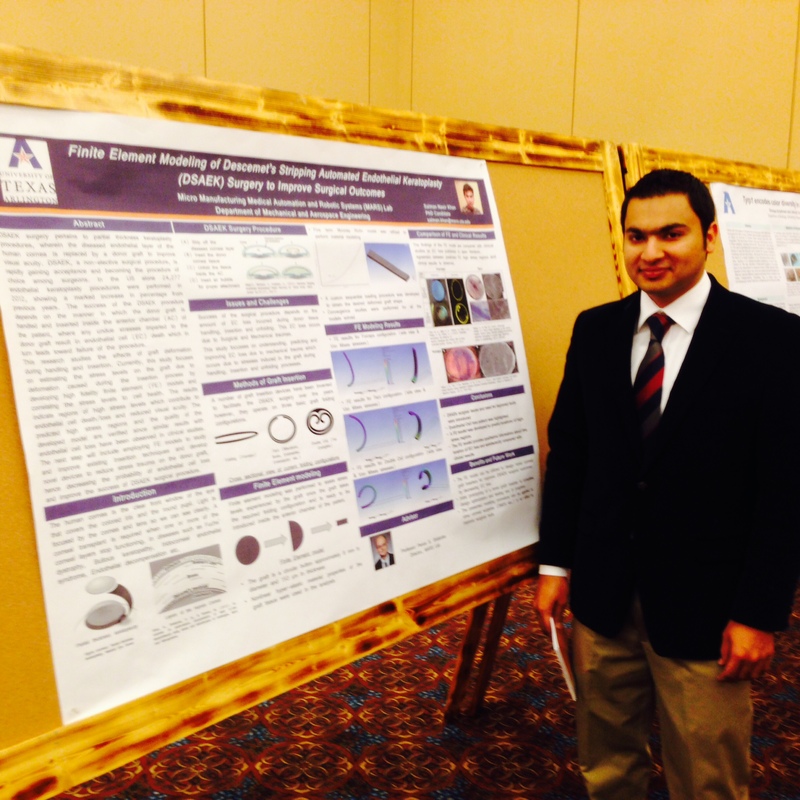 Salman participated in UTA's ACES 2014 symposium on March 26, 2014 with a poster on his research work titled Finite Element modeling of Descemet’s Stripping Automated Endothelial Keratoplasty (DSAEK) surgery to improve surgical outcomes. 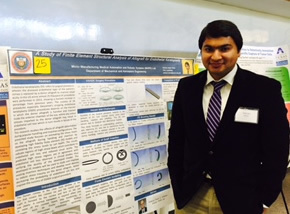 Salman was awarded an honorable mention on the Graduate Poster Presentations. ACES awards web page http://www.uta.edu/aces/awards.php. Congratulations are in order for Prashanth - keep up the great work! Prashanth Ravi was awarded the Carrizo Oil & Gas, Inc. Graduate Research Fellowship for 2013-2014 at the College of Engineering awards baquet on February 21, 2014. This is a competitive award for first semester doctoral or doctoral bound students. 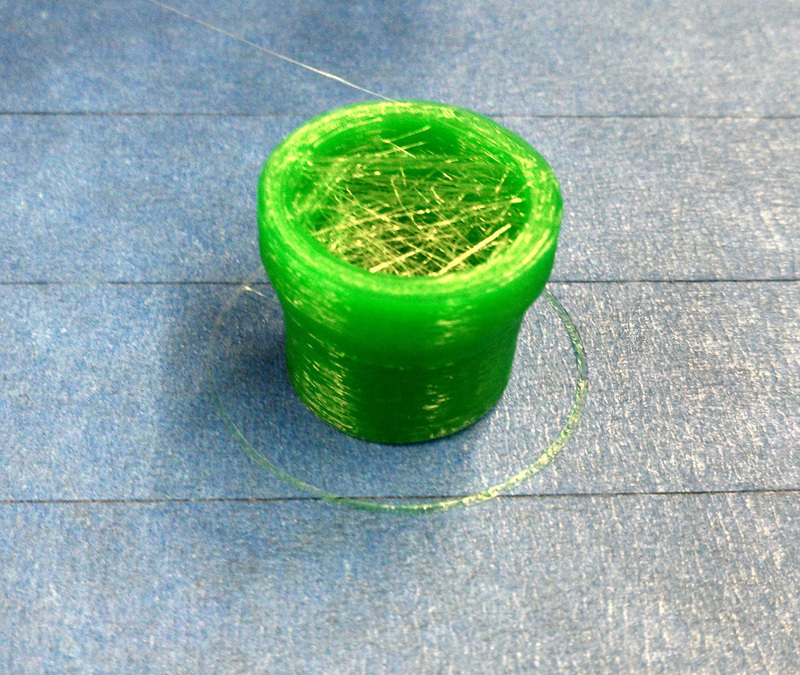 The 3D BioPrinter group is on a roll! The successful interface of the hardware and software modules is opening up doors for research activities in many areas of additive manufacturing (aka 3D printing). Information will be uploaded and shared as appropriate.Since the majority of this group are high speed racing enthousiasts, all I can say to them is Start Your Engines and Race! The 3D BioPrinter project successfully printed their first single layer component using their first dispenser design based on FDM and PLA built material on Jan. 14, 2104 and a few days later they had real components - the two cups on the right. Congratulations! They have been working hard to improve the module design, incorporate more capabilities on and experiment with the BioPrinter while having fun printing parts with it! Chris Abrego and Prashanth Ravi passed their PhD diagnostic examination, the first examination towards the doctoral program in January 2014. Congratulations and keep up the great work! Salman succcessfully pesented and defended his doctoral research proposal (aka PhD Comprehensive) in December 2013. His research proposal is titled On Improving Surgical Outcomes of Partial Thickness Corneal Endothelial Keratoplasty. Congratulations! Reggie successfully presented his masters project in December 2013 titled Modeling and Analysis of a Thermoelectric Cooler for Localized Application. Congratulations! Adil successfully presented his masters project in December 2013 titled IntestineBot: Conceptual Design and Preliminary Analysis of an Intestine Robot. Congratulations! Musab successfully presented his masters project in November 2013 titled Investigation of LabVIEW- sbRIO for a MagLev Device for Teaching and Research. Congratulations!